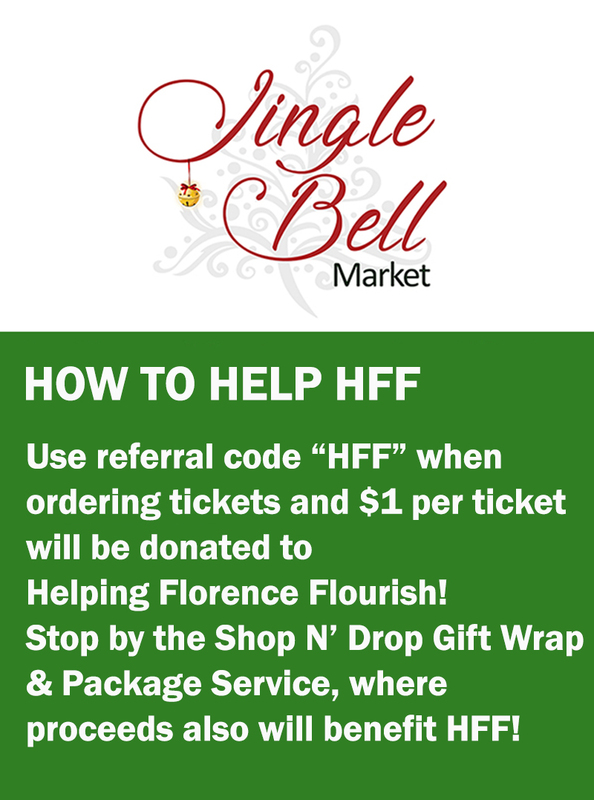 Helping Florence Flourish will be participating in the inaugural Jingle Bell Market at the Florence Center, 3300 W. Radio Drive, from Nov. 15 to Nov. 18. And when you purchase your tickets, please mention our referral code: HFF so we may benefit from your participation! The Jingle Bell Market is an upscale, full facility indoor show that will be filled with many different areas of interest from Christmas gift ideas, vintage finds, apparel, jewelry, beauty and wellness to gourmet treats. Show hours are 6-9 p.m. Thursday, Nov. 15; 9 a.m.-6 p.m. Friday and Saturday, Nov. 16-17; and 10 a.m.-4 p.m. Sunday, Nov.18. – Visit our Box office at 3300 West Radio Drive. As you start your Jingle Bell shopping adventure, you will enter the show through the Festival of Trees with beautifully decorated trees of all sizes and shapes displayed in themed vignettes as a silent auction to benefit The House of Hope. The market also will host a Shop N Drop station to check your packages along with gift wrap services available with all proceeds benefiting Helping Florence Flourish. Grinch’s Grotto will be open for a leisurely lunch and libations. Also, watch a good old Southern ballgame on our supersized screens. Moving through the show you will enter Christmas Craft Cove featuring beautifully handcrafted jewelry, gifts and home décor. Then onto to the Jingle Bell Junction and Mistletoe Manor you will discover more handcrafted gifts, chic boutiques, apparel, accessories, jewelry, gourmet yummies, and much more. Take a break and visit our Christmas Café and dine on delectable Southern dishes featuring our local SC Specialty Food companies. Our executive chef will be stirring up their special Southern recipes in the Café. Then visit our Fa La La Farmers Market to discover our SC Specialty Food Market with holiday gourmet treats, specialty rubs, sauces, spices, libation mixes, jams and jellies and tastings with our wine vineyards. Also, featured in the Fa La La Farmers Market is our Vintage Holiday Market with vintage finds, shabby chic inspired antiques, furniture, frames, artworks, pottery, repurposed pieces, and garden décor. This will be a treasure trove of vintage holiday gifts, home décor and DIY projects. Also in the Farmers Market is a convoy of mobile fashion trucks loaded goodies — apparel, shoes, and accessories and vendors with onsite monogramming services. Also, Santa’s Workshop will be bustling with activity as Santa and his Elves will be posing for holiday photos and the children may write letters to the North Pole to benefit the Durant Children’s Home. Join us for the special reading of children’s book author, Karen Gilbert and the Rufus T Crouse Tales. To honor our servicemen and women, Quilts of Valor Foundation also will be represented. Their mission is to cover all U.S. service members and veterans touched by war with a Quilt of Valor. Presentations to selected veterans will be made at 2 p.m. daily in our Special Events Concourse on Friday through Sunday. More holiday entertainment, seminars, prizes, and contests will be presented throughout the weekend. Lots of food, fun and folks that like to shop! There is something for everyone! For more information, visit its website, www.jinglebellmarket.com.